The key to good tamales is to spread the dough thinly on the corn husk. Fill with a generous amount of pork and steam to perfection. It is a bit time consuming, so I like to prepare the ingredients one day and the second day do the assembly and steaming. It has always worked best for me. Day one: make pork, soak corn husks and make chili sauce. Day two: Make masa dough and assemble, then steam and freeze tamales if desired. Make Mexican pork and keep in refrigerator until ready to use.Soak corn husks in bowl of water overnight. Rinse and clean corn husks thoroughly the next day. Drain well and pat dry. To make the chili sauce use rubber gloves to protect your hands from the hot peppers. Do not touch your face or eyes once you start working with the peppers. Preheat oven to 350°F. Remove stems and seeds from dried chili peppers. Place peppers in a single layer on a baking sheet. Roast until you smell a sweet roasted aroma, checking often to avoid burning. Remove from oven and put the peppers in about 6 cups water for 30 minutes until cooled. Once cooled put pepper and 3 cups soaking water into a blender, add garlic, cumin and salt. Cover and blend until smooth. Keep the remaining soaking water to use later. In a 2-quart sauce pan, stir flour into oil or melted shortening over med heat until browned. Carefully stir in blended chile/water mixture. Simmer uncovered for 5 to 10 minutes or until slightly thickened. Use the remaining soaking water if the sauce gets too thick, add enough until you reach the desired thickness. Mix the shredded pork with one cup of the chile sauce. In a large bowl, beat the shortening with a tablespoon of the broth until fluffy. Combine the masa harina and salt; stir into the lard mixture, adding enough chili powder to make the dough pinkish in color. Add more broth as necessary to form a spongy dough. Spread masa about 1/8 inch thick on corn husk with fingers, leaving about 1/2 inch border along the sides and 2 inch border along the top and bottom of husk. Use about 2 Tbsp. of shredded meat to fill each one. Fold sides until they just overlap, fold narrow end under, and place folded side down and place in a steamer for about 45 minutes to an 1 hour until masa is not longer sticky. 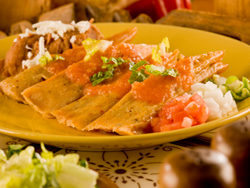 Remove tamales from corn husks and place on a serving platter. Drizzle remaining chile sauce over top. Add a spoon of sour cream and serve immediately. To freeze tamales, steam for only 15 minutes. Wrap or store in freezer bags. When ready to have them, just steam for an additional 30 minutes.